How do I recover a lost slidecrew account password? 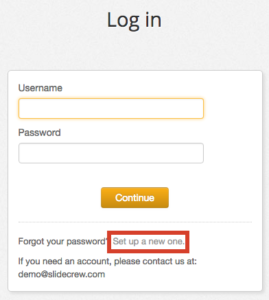 Have you forgotten your Slidecrew account password and now want to recover the lost password? Even the most tech savvy people forget their passwords now and then. That’s why Slidecrew makes it super easy to recover a lost password securely. In this article, we will show you how to easily recover your lost password. Replace, example.slidecrew.com with your website address. Your Slidecrew portal login screen has a “Forgot your password? Set up a new one” link just below the login form. You will be asked to enter your email adres and if your email is in our database we will immediately send you a reset link. If no email is received within 10 min, please create a ticket, we will help you to get back on your feet. What information do I need to put in an excel file that will be imported? How do I configure a presentation laptop for my event? How do I remove a file from a presentation?